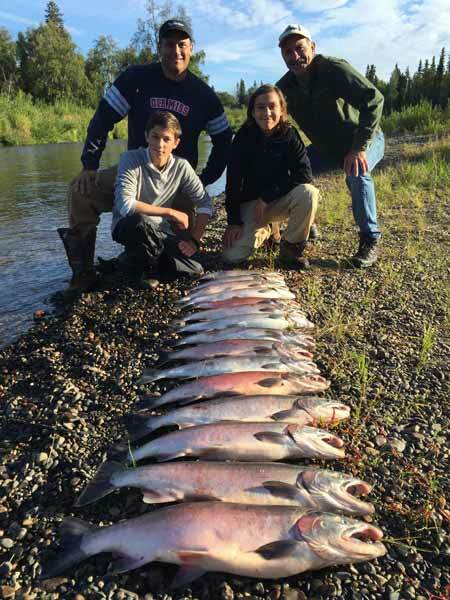 We offer fully guided Alaska salmon fishing trips to The Deshka River, Little Susitna River, or tributaries of the Big Susitna River. 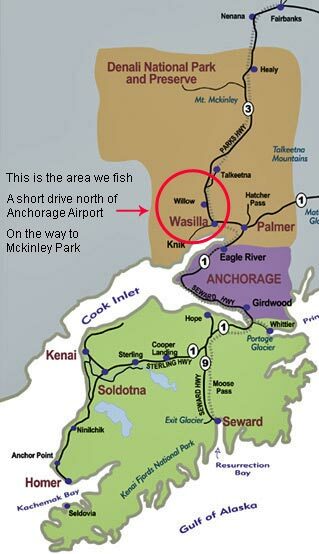 These are some of the most productive salmon fishing streams within driving distance of Anchorage. Ride with us in our jet powered custom built river boats into wild Alaska which can only be accessed by boat or airplane. We take you where the roads don’t go where you’ll experience the real Alaska. Compare our prices and you’ll see they very affordable. Plus, since our charters begin just a short drive north of Anchorage, it means our salmon fishing charters are much easier and affordable to get to than other fly out trips or destinations located much further away. We take hundreds of people salmon fishing every summer and many are families with children. Our fishing guides are family friendly folk that talk and behave in a way that we would want someone to act in front of our own kids. If you’re looking for fun things to do near Anchorage, then you’re in luck! Our Alaska salmon fishing trips are the closest guided salmon fishing charters to Anchorage. 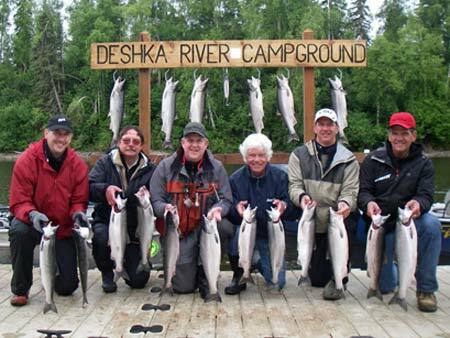 iFish Alaska Guide Service salmon fishing trips depart daily from either the Deshka River or Little Susitna River, which are only a short 90 minute drive from Anchorage, and a 45 minute drive from Wasilla. Click on the buttons below to print detailed driving directions to the places where we meet you for our Alaska trips. The morning trips are by far our most popular salmon charters! Even though it means an early wake up call, it’s well worth it because day in and day out the “bite” tends to be better on our early morning trips. If early mornings are not your thing we also offer afternoon trips. These charters are more convenient for those with small children or for folks that have to travel a long way to get here. Full day extended charters means we can cover more water and fish longer which provides you and your party the best chance to catch fish. These charters require a minimum of 4 people to book. We take pride in providing safe, family friendly, Alaska salmon fishing adventures in one of the worlds most beautiful places. Our salmon fishing trips are the closest guided salmon fishing trip to Anchorage, which makes them some of the most convenient and affordable fully guided fishing trips found anywhere in Alaska. Ride with us in one of our comfortable custom welded jet powered boats, and let us take you “off road” to some of the most productive fishing Alaska has to offer. We fish calm river systems running our boats upriver through shallow riffles where cars and foot traffic can’t go. We offer both morning and afternoon charter option to fit your travel schedule. Mornings tend to be more productive but we still do catch good numbers of fish all day long. 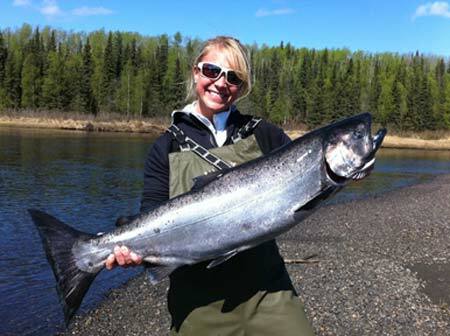 Our experienced fishing guides specialize in salmon fishing local rivers systems such as the Deshka and Little Susitna. Their patient instruction and extensive knowledge work together to provide you with a fishing trip of a lifetime. If you’ll be near Anchorage Alaska and you dream about catching an Alaskan salmon, then we hope you will call iFishAlaska Guide Service 1 (907) 357-0131 or book online to schedule your next Alaska fishing trips with us. 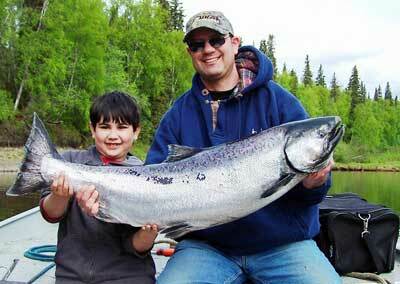 iFish Alaska Guide Service now offers hooligan fishing charters on the Big Susitna River in mid to late May. When these little fish run in the Big Su you can fill up coolers full of them in just minutes! Typically we see hooligan start to show up in the last week or two of May and the run usually lasts for about a week. Call us to get on the list and when we see the run starting to show up we will call you to schedule a time for you to get on the boat. 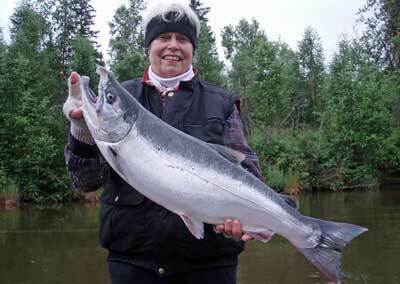 iFishAlaska Guide Service offers fully guided Alaska salmon fishing trips close to Anchorage. If you have friends or family visiting this summer or if you are planning Alaska fishing trips for your Alaska vacation, we’d love to take you on one of our salmon fishing trips. Owner and guide Spencer Cook, has years of experience salmon fishing in the local area streams that he will guide you to. Spencer’s extensive knowledge, expertise of fishing local streams, his love for Alaska, and his “family safe” attitude and personality, are all reasons why people come back year after year to fish with him. He loves sharing his experience and love of fishing and this land with all of our guests. Our Alaska fishing trips mainly target two species of Alaska Salmon: king and silver salmon. We offer 3 different Alaska fishing tours for your convenience. Our fishing guides are licensed and carry credentials with both the Untied States Coast Guard and the Alaska Department of Fish and Game. We’re insured, first aid certified, drug tested and experienced on the rivers we fish. When you go Alaska salmon fishing with us, you can rest assured that we will do our best to keep you safe. All of our Alaska fishing trips are conducted with a USCG licensed guide. Pat was an amazing fishing guide. His knowledge of Alaska was a plus! We had a group of family and friends on this trip. Pat knew just the right fishing spots. We limited out and got to bring some amazing salmon back to New Orleans. Thanks, Pat, for making our trip the best! This was the best fishing experience! Pat Donelson was an absolutely great guide, showing his love for the outdoors and his Alaskan experiences. I would highly recommend iFishAlaska for you next guided service. Thanks, Pat, until next time.....Susan, John, Whitney and Johnny.